Feel the Invigorating Difference with an Oxygenics TriSpa Showerhead! Using the same principle as a jet engine, the Oxygenics TriSpa showerhead continually draws in fresh oxygenated air through 16 intake ports and infuses it into the filtered water, creating a powerful oxygenating spray of revitalizing oxygen enriched water. The moment you turn it on you realize this is like no other showerhead you've ever experienced. Oxygenics showerheads increase the water's oxygen content up to ten times, helping to enrich your shower water, and leaving your skin and hair cleaner than ever before. Finally, a showerhead that is as smart as you. The TriSpa incorporates the smart patented technology of Oxygenics into an all-new revolutionized multi-spray shower head. It offers THREE pressurized spray patterns for a dynamic and luxurious shower experience. It is like nothing Oxygenics has ever done before and like nothing you've ever tried. The first setting is the patented Oxygenics core, which combines revolutionary technology and precise engineering for the shower of a lifetime. The patented technology infuses oxygen into each and every drop. The dense pressurized spray pattern will envelope you in blissful pleasure. The Oxygenics TriSpa showerheads never clogs up or needs cleaning and is designed to work as well in 20 years as it does when new. The Oxygenics TriSpa fixed showerheads come in brushed nickel and gold. 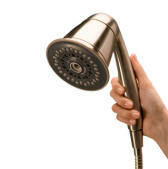 The TriSpa hand-held showerheads come in chrome and brushed nickel. NOTE: We have one slightly used Chrome TriSpa Handheld in stock for $45.56 (20% savings). To order it, click here. Developed for the customer that prefers an TriSpa showerhead, the Oxygenics TriSpa Shower Head is the perfect solution. All Oxygenics TriSpa Shower Heads are CSA Approved and ADA Compliant and include flow control, leak-free washers, teflon tape and installation instructions. Add a Sprite Shower Filter with patented Chlorgon media to your Oxygenics Shower Head for the ultimate shower experience. Oxygenics Fixed showerheads work with Sprite High Output (1 year filter) or Slim-Line (6 month filter) Shower Filters, while Oxygenics Hand-Held showerheads work with the Sprite Universal In-Line (3 months) Shower Filter.